Santa Claus has made arrangements with the Easton Volunteer Fire Dept. to make a special appearance and visit many of the neighborhood children starting Sunday, December 3rd. He will be landing at the Easton Volunteer Fire Department to hitch a ride with the firefighters who will bring him via fire truck. On Sunday 12/3 between 12p & 3pm, Santa will visit Mulberry Station, Matthewstown Run, Hunters Mill, Crofton, Golton, Bretridge. 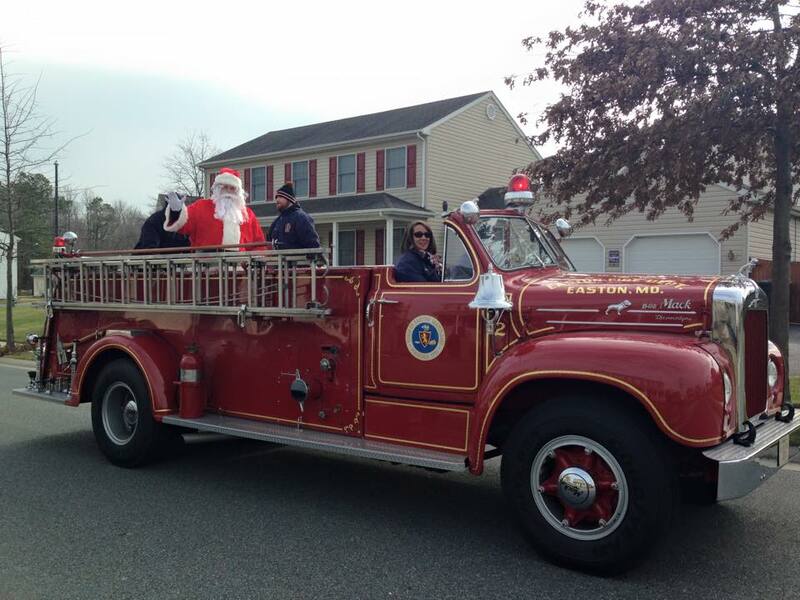 On Sunday 12/10 between 1pm & 4pm Santa will travel the streets of Easton located between Rt50 & Easton Bypass and Chapel East. Santa and several of his elves will begin their tour, around and work their way through the Town of Easton. Santa and his escorts will blow the sirens and horns as he approaches, so you’ll be sure know when he’s coming to your area. He’s bringing candy canes. He’ll do his best to make it to your street, but you may want to make sure you see him if you hear him nearby.